which – in German – means “Opposites”. 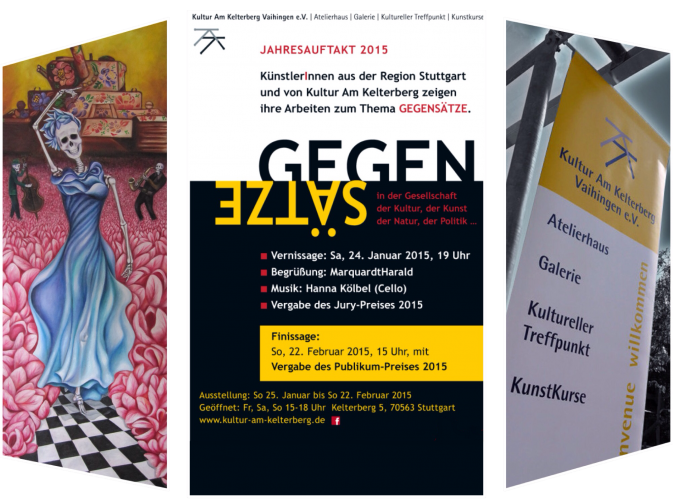 The exposition is organised in the cultural centre “Kultur am Kelterberg”, in the Stuttgart’s suburb of Vaihingen, and can be visited until the end of February. Visitors are invited to vote for their preferred artist. The winner of the public voting will be awarded the Public Prize during the closing ceremony scheduled at 3 PM on Sunday the 22nd of February 2015. Posted on Monday, January 26th, 2015 at %I:%M %p. Filed under: Exposition, News RSS 2.0 feed.